The 2007 campaign in the H.U.N.E. 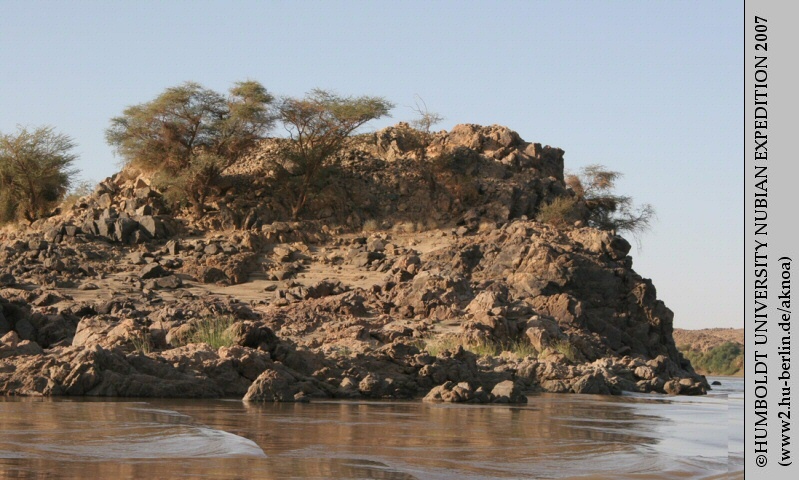 island concession in the Dar al-Manasir above the Fourth Nile Cataract was conducted from 27th January to 1st April. It was funded by the Packard Humanities Institute and the Gerda Henkel Stiftung. Before fieldwork commenced the project was introduced to members of the high council representing the Manasir people, who kindly lent their support to the H.U.N.E. mission. Their support, as well as that of our numerous local Manasir helpers, together with the dedicated work of our colleagues of the National Corporation for Antiquities and Museums (NCAM) allowed the successful completion of the fourth H.U.N.E. field season. Works in the 2007 season focused on two large river islands, Us and Sur. 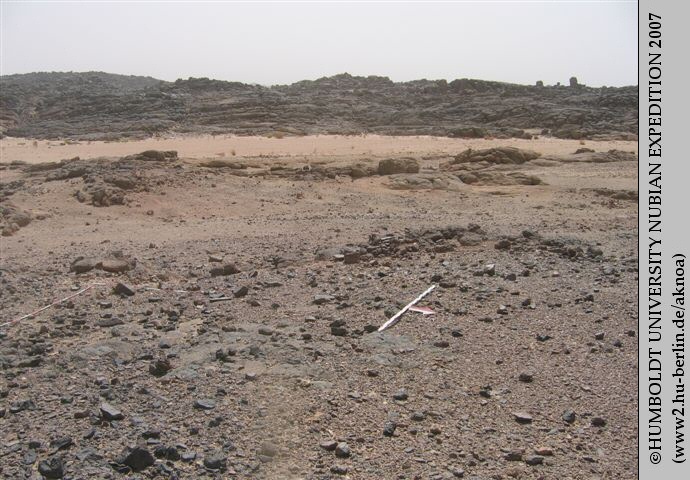 On Sur, excavations took place at the church SR022.A in the north of the island and at the Kerma period habitation site SR018.A in its south. A general archaeological survey of the island was undertaken as well as a specialised rock art survey. The fortress on the tiny island Umm Kieb, located off the northern tip of Sur, was mapped and a trial excavation was undertaken. 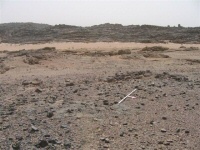 On Us, the excavations concentrated on two settlement sites of the Kerma period (US037 and US304) in the vicinity of the hamlet Shaqqaiq in the south-west of the island. In the vicinity of these sites further excavations were undertaken at two rock art localities, US198 and US303. 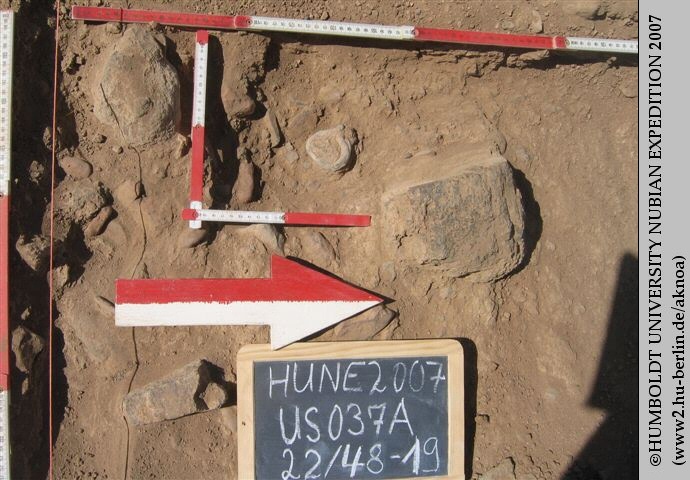 Two cemeteries of the Kerma period (US019 und US307) which had recently been robbed, were investigated in order to save at least the remaining chronologically diagnostic material. Smaller surveys were undertaken of some of the most interesting find spots in order to complete the survey coverage of the island. 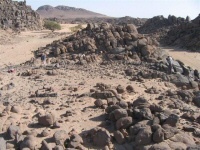 The intensive rock art survey of the island, which was begun in 2005, was continued in this season. 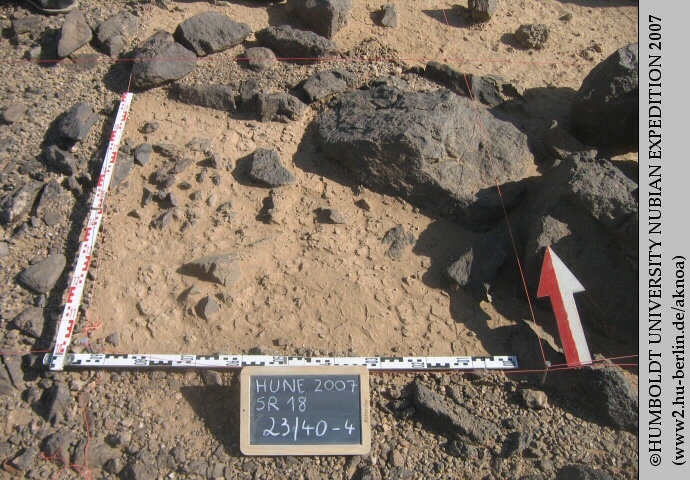 One of the major objectives of the 2007 season was the large-scale excavation of site SR022 close to the northern, i.e. upstream tip of the island, which had already been identified in the 2004 survey. It turned out to be the largest Christian site within the concession area, including the remains of a church which according to surface finds is thought to date to the Classic Christian period. The church is surrounded by cemetery areas and other buildings, which might prove to be a monastic complex. The importance of the site ranges high in the archaeology of the entire region. Within six weeks, the church SR022.A with a preserved ground-plan of c. 17 x 15 m was excavated. 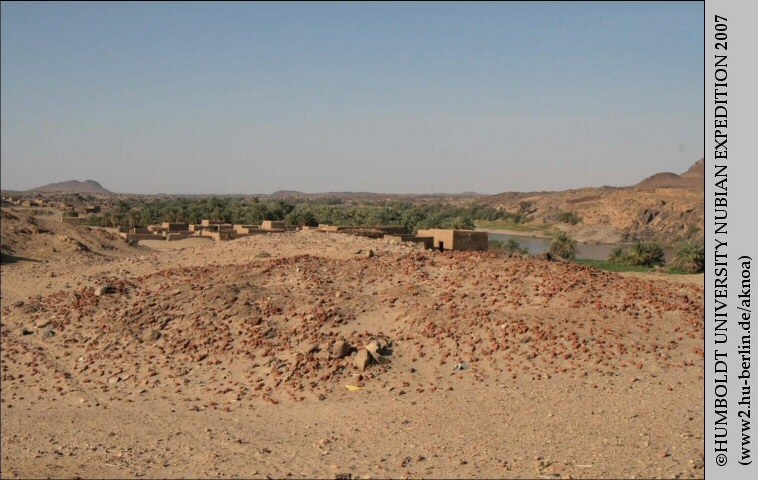 Its walls are of mudbrick with some fired bricks present especially in the foundation layers. With only some walls missing the principal cross-shaped structure of the building is well recognizable. 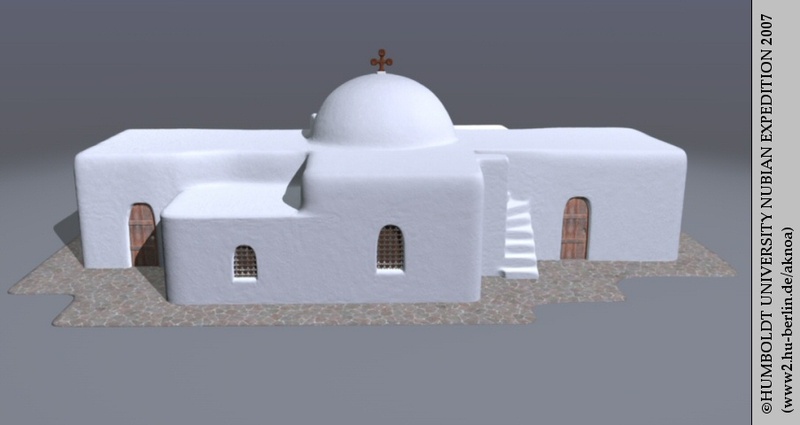 It has additional small rooms in the four corners of the cross, a layout typical for Nubian church architecture from the 10th century onwards. A rare feature in this period is the oblong sacristy behind the sanctuary, which is accessible from the southeastern corner room. From this sacristy, the most valuable finds derive: over one hundred text fragments in Greek and Old Nubian on parchment and leather, several hundred pieces of leather bindings and small metal objects, such as a spoon and a bell apparently for ritual use. A solid wall formation in the western corner of the building indicates a staircase originally leading to the roof. A concentration of fired bricks in the rubble in the central space of the cross allows the reconstruction of a cupola or dome as roofing installation in this part of the building. 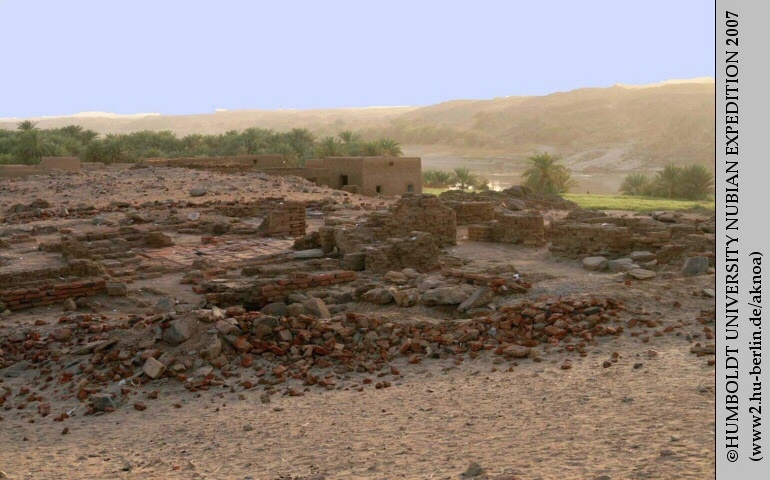 Remains of the mudbrick ambon are recognizable at the northern side of the central space. The sanctuary of the church i.e. the eastern arm of the cross preserved a pavement of fired bricks and a low altar built of rough stones. 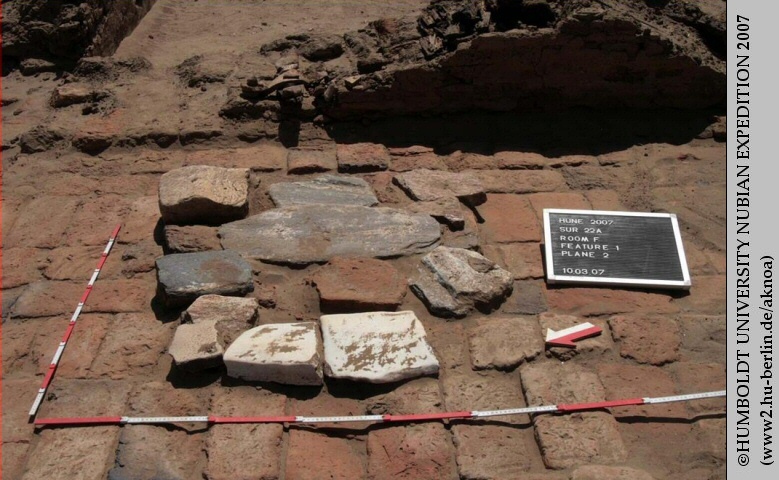 The preliminary analysis of the finds, above all the pottery, confirmed the dating of the church SR022.A into the Classic Christian period, c. the 10th century AD. 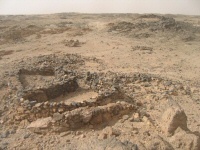 The entire northern end of Sur abounds in sites of the Christian period, with the church SR022.A representing a religious centre of at least regional importance in this era. Not less than five settlements and five cemeteries of Christian date have been located in its vicinity. 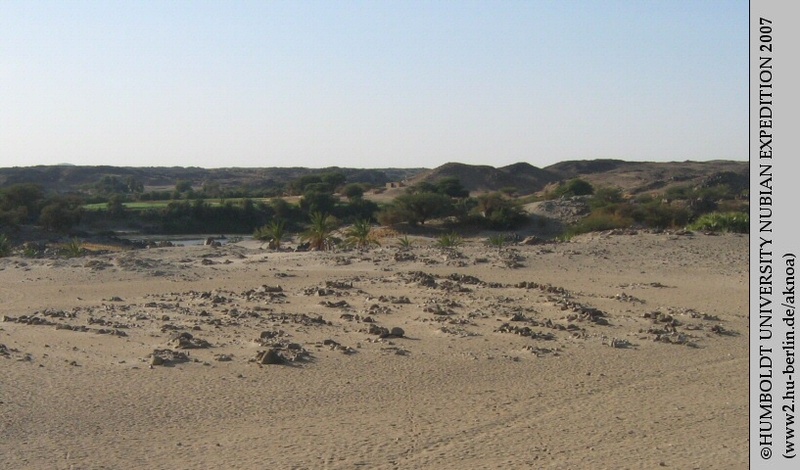 Furthermore, three post-Meroitic and one Meroitic/post-Meroitic cemetery were recorded, testifying to the importance of this part of the island also in the previous periods. 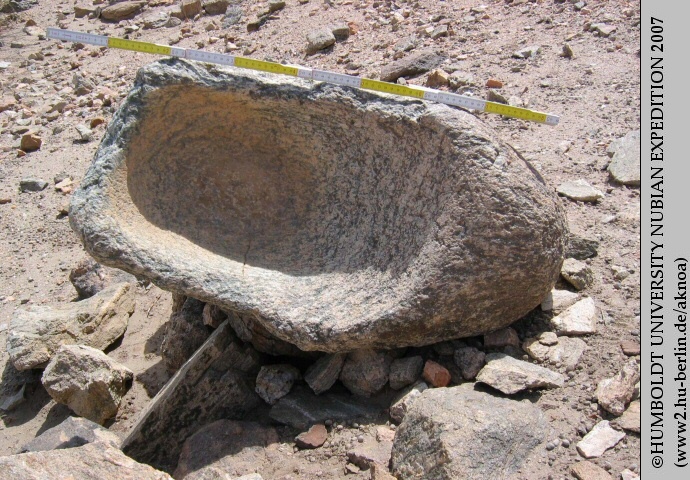 Photo1: Kom of the church SR022.A before excavation. Photo2: Church SR022.A after excavation. Photo3: Altar and red brick pavement in situ, church SR022.A. 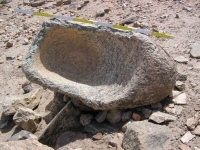 Photo4: Vessel in situ at church SR022.A. 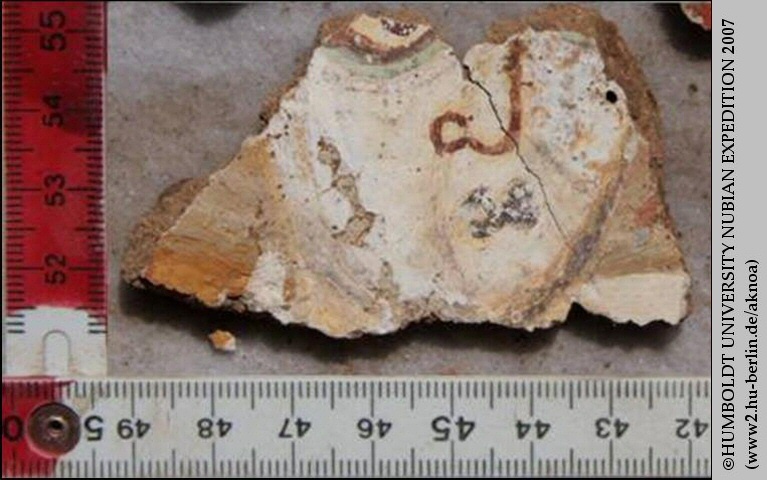 Photo5: Fragment of wall painting from the church SR022.A, with part of a face preserved. Photo6: Painted Christian fine ware pottery from church SR022.A. 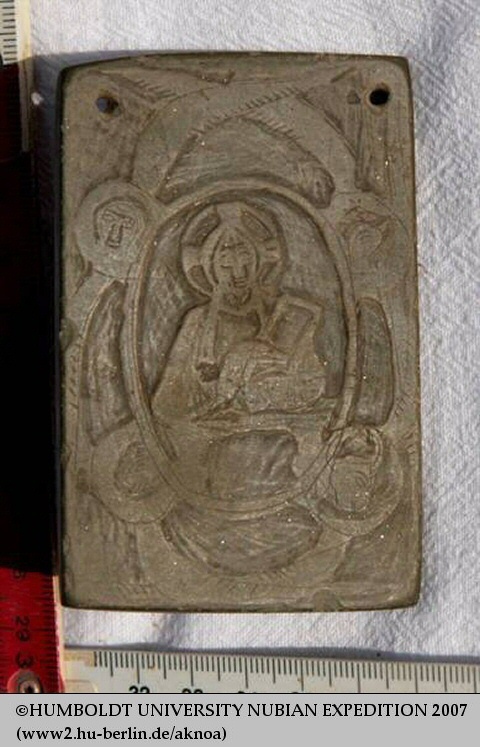 Photo7: Plaque with image of Christ and the symbols of the four apostles from church SR 022.A. 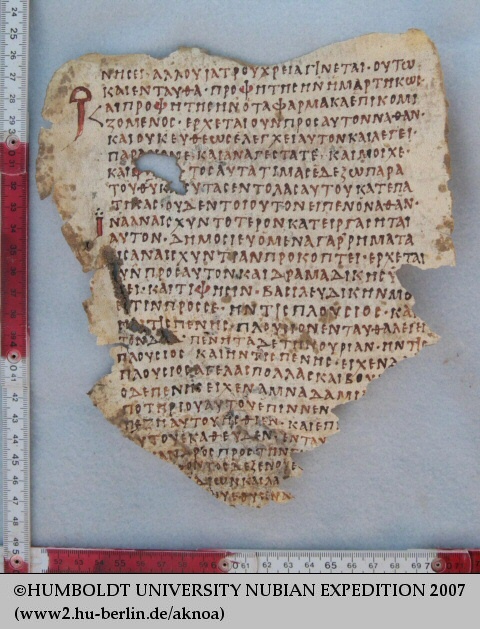 Photo8: Sheet of Greek text from SR022.A. 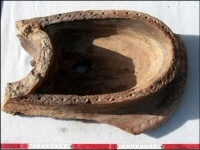 Photo9: Pottery toilet from church SR022.A. 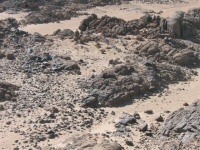 Previously, only a small part of Sur island, which measures about 7 km in length and 2 km in width, had been investigated in the 2004 reconnaissance survey. In the current season, 99 new sites were recorded, among them 38 rock art sites. With this, survey coverage of our concession area is substantially complete. The chronological range of the newly discovered sites on Sur confirms and completes the picture gained on the other islands. Evidence for Palaeolithic occupation derives from the central rocky plateau of the island, where several knapping sites of Middle and Upper Palaeolithic date could be located. With altogether ten sites – habitation areas as well as cemeteries – material from the Neolithic period is unexpectedly frequent. Cemeteries and settlements of the Kerma period occur in large numbers. 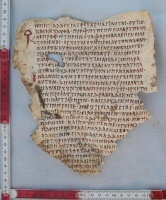 The record of the following periods up to the Meroitic era again is limited. 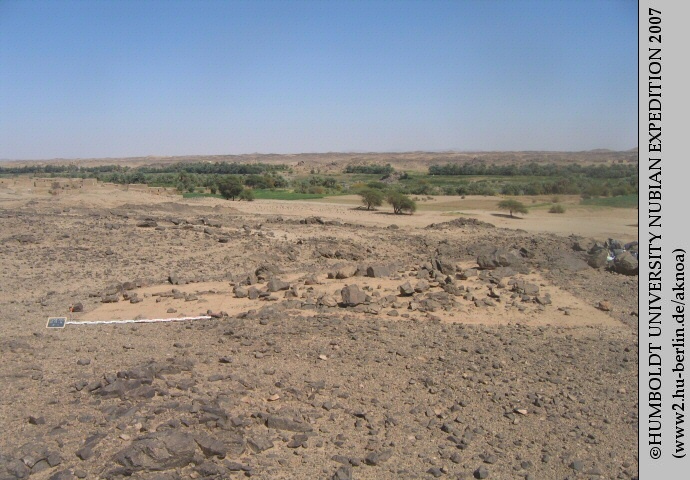 The post-Meroitic period is represented with three of its typical prominent cemeteries. Christian sites are the most frequent, also on Sur. Sites of all periods are distributed over the entire island, with the exception of major stretches of its western bank, which also today is widely uninhabited. In this part of the island the rocky hills come close to the river, leaving only a small bank unsuitable for extensive settlement or agriculture. In contrast, the eastern part of Sur shows a dense distribution of settlements. Correspondingly, on the edge of the rocky plateau to the island interior, a more or less continuous chain of not less than ten Kerma cemeteries could be detected; additional ones had already been recorded in the 2004 reconnaissance. Furthermore, one knapping site of Neolithic/Kerma age, three Neolithic settlements and two Neolithic cemeteries were identified in this area. 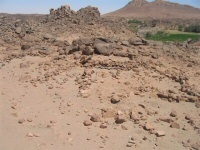 In the southern part of the central plateau, one mining site for quartz rocks, apparently used in Kerma and Christian times, has been found. 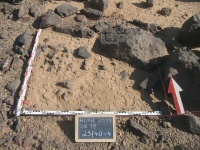 One habitation site of the Kerma period, SR018.A, was investigated more closely. 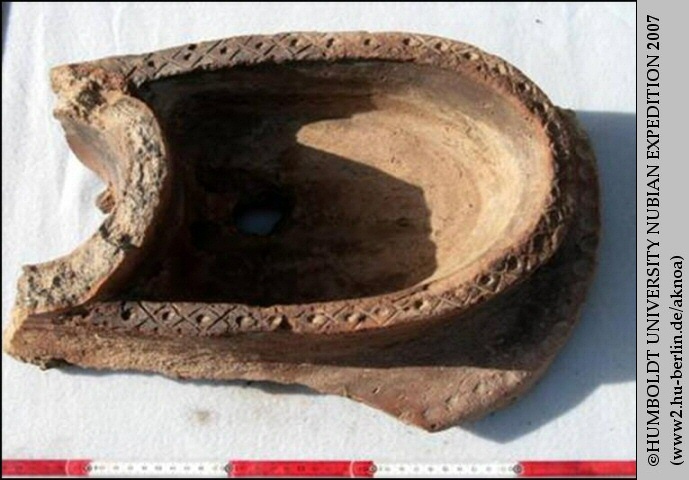 The trial excavation indicated a Kerma date for it, with about 95% of the over 2000 recovered potsherds being of the typical Kerma settlement ware. Photo10: Box grave cemetery SR067. Photo11: Christian settlement remains SR082. Photo13: Surface clearing at SR018.A. 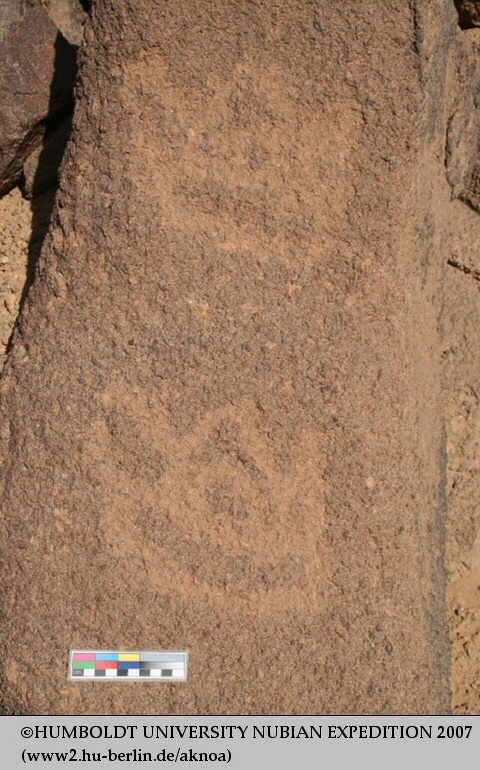 On Sur 38 rock art sites were identified. They are primarily located on the central plateau and close to the western bank to the island, an area that revealed only few other archaeological remains. 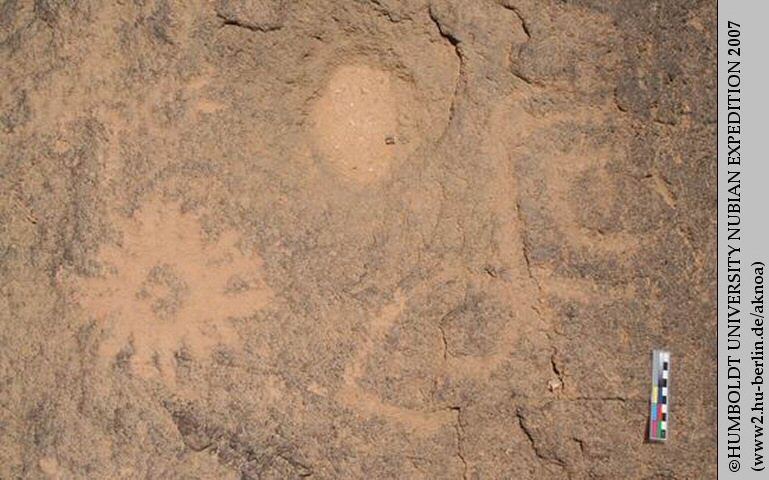 The rock art corpus comprises a restricted range of motifs. 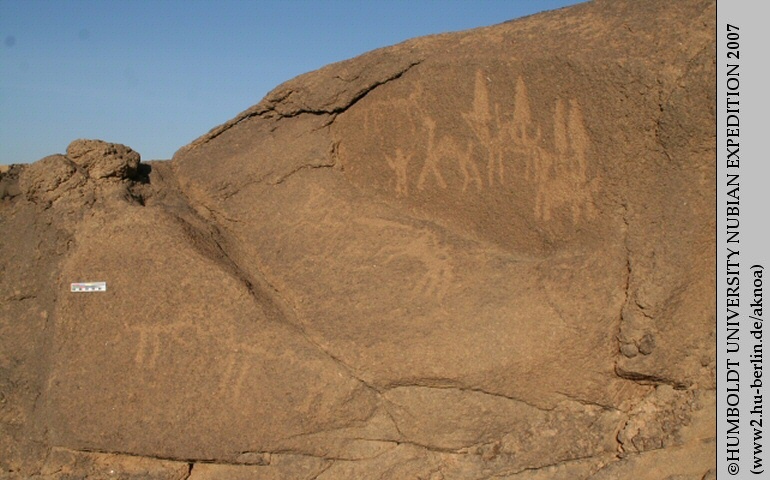 It is characterised by camel depictions, which are found singly or in small clusters scattered across the island. 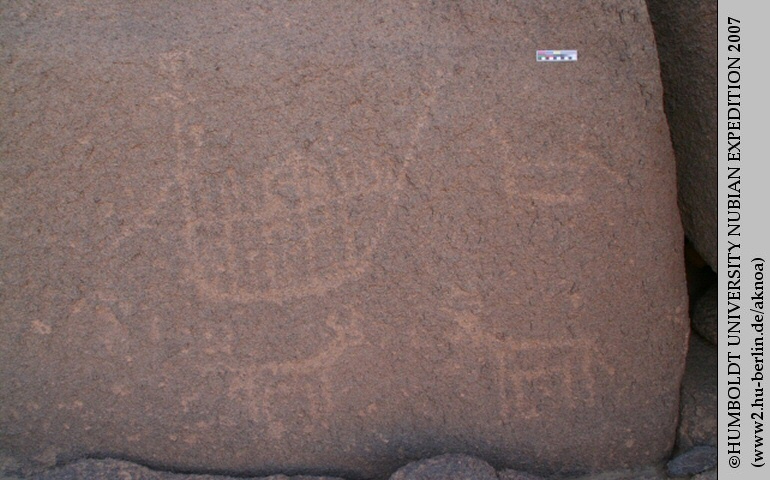 Very few sites show an element of an older, cattle-dominated rock art tradition. 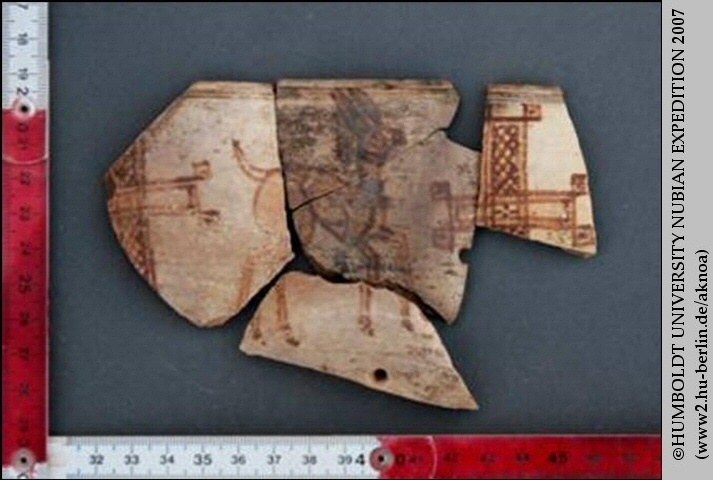 Anthropomorphs, bird depictions and geometric motifs were also documented. While the paucity of rock art on Sur can, at least in part, be explained by the unfavourable geological conditions on the island, it also confirms the singularity of the neighbouring island Us with its exceptionally rich rock art record. 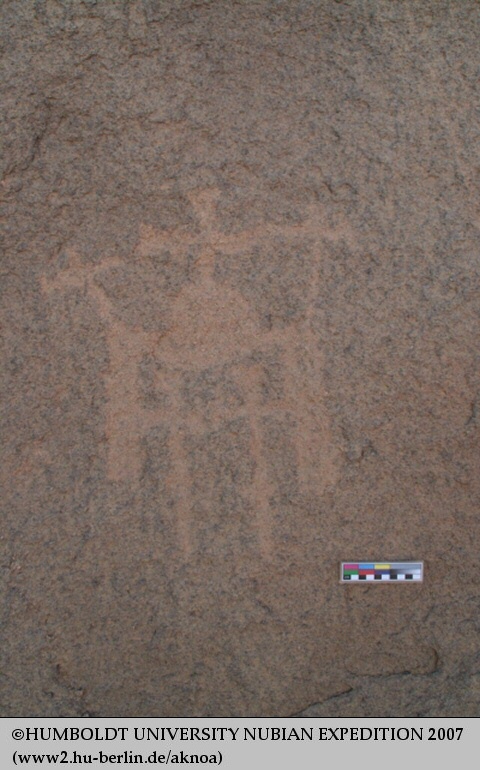 Photo14: Geometric form and cattle motif from Sur. Photo15: Birds and camels from Sur. The small island of Umm Kieb, which is uninhabited today, is located close to northern tip of SR022. Its northern part is occupied by a small fortress, which had also first been located in the 2004 season. 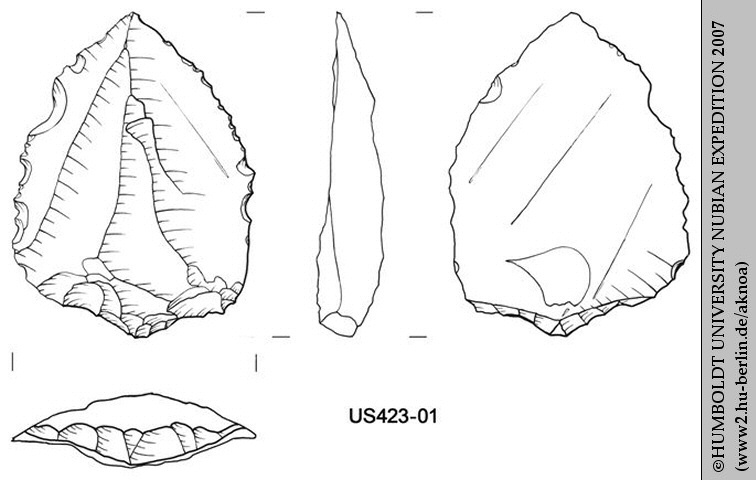 Surface finds mainly dated to the Islamic period (after 1500 AD), but there also was some earlier sherd material. 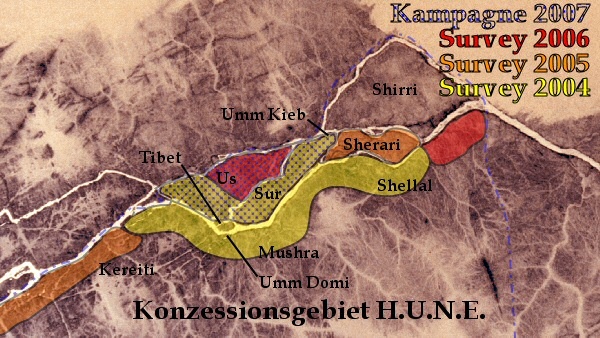 Especially the close spatial relationship with site SR022 made the fortress of Umm Kieb an important object of study. 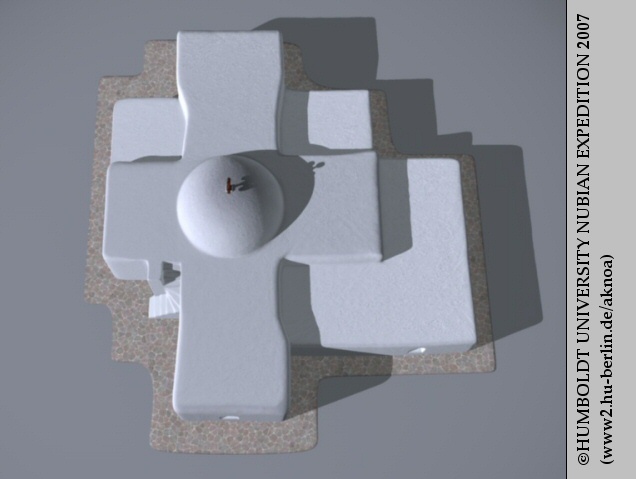 During the current campaign, a detailed ground-plan of the structure was produced by our architect Peter Becker. Closely following the local topography, the fortress is only roughly rectangular, about 42 m long and at its maximum 30 m wide. Steep cliffs prevent the access from all but the southern side, where also a habitation area outside of the walled space could be identified, yielding pottery from the post-Meroitic through to the Classic Christian period. 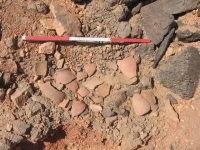 Intensive sampling within the fortress resulted in a pottery corpus which is composed of Early to Classic Christian and Islamic material. The outer walls of the fortress are built directly on the bedrock of the cliffs. 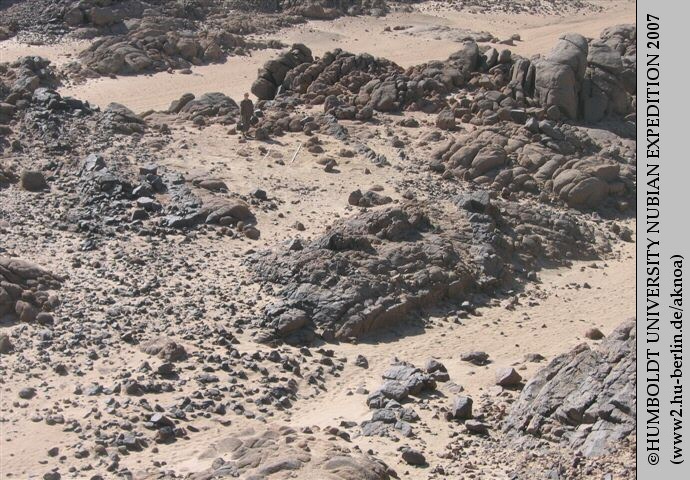 They are 1.5 to 2.0 m strong and consist of two stone shells and a rubble filling. The fortress is entered through a breach in the southern wall, most of which has collapsed. While most constructions within the fortress are rather flimsy and of apparently (sub)recent date, a very conspicuous feature is situated east of the entrance area. 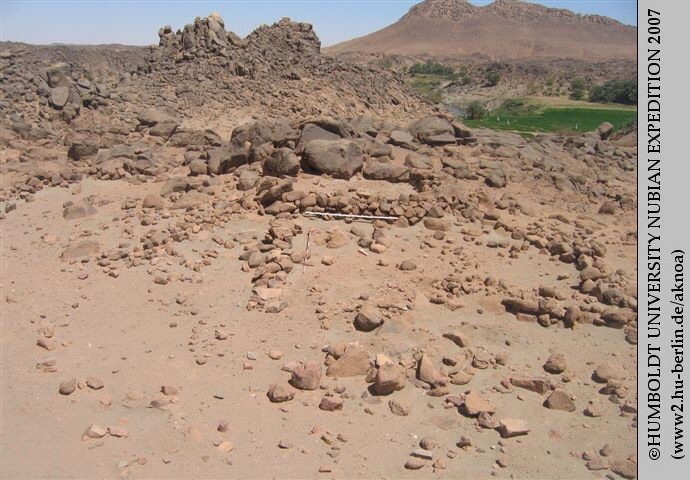 Its investigation revealed a solid, tower-like building of about 4.0 x 3.5 m, made of rough stones and reused bricks, with its interior filled with stones and rubble. 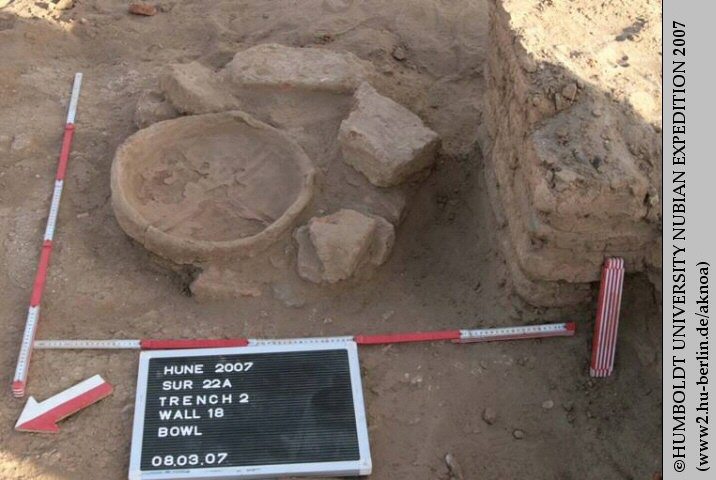 The building seems to be an Islamic addition – explaining also the prevalence of pottery of this period on the site surface – and may represent the lower part of a bastion or watch tower, whose upper storey was constructed of perishable material. Photo16: Fortress UK001 as seen from the river. Photo17: Heavily worn stone quern from UK001. The sites US037 and US304 are located in a khor, which must have been a side-arm of the Nile at the time of the Holocene climatic optimum. 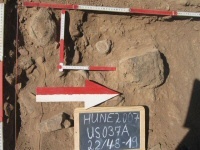 The localities are found about 200 m south of the Neolithic settlement site US007, which was investigated in the 2005 season. Both sites were characterised by a dense clustering of finds on the surface, especially of lithics and ceramic sherds. Finds and features were mapped using a total station. At US037 bone material, such as fish and cattle bones, was exceptionally well preserved. At both sites an area of 50 m² was cleared and selected quadrants were excavated. While at US037 the sediments were eroded to a point that no features were evident, a fireplace was uncovered in c. 20 cm depth at US304. Charcoal was retrieved from the fireplace in sufficient amounts to allow radiocarbon dating. Remains of habitation architecture were not found. However, the newly recovered material in the form of lithics, pottery and above all faunal remains will substantially enlarge our knowledge on the lifestyle and the economy of the prehistoric populations of the Fourth Cataract. 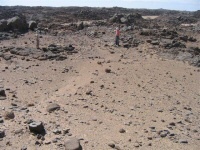 Photo18: The Kerma habitation site US037 in its landscape situation. 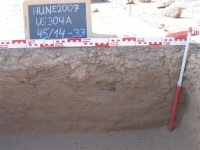 Photo19: The excavation area at the Kerma habitation site US037. Photo20: US037: cattle vertebrae bone in situ. Photo21: Cattle vertebrae bone from US037. 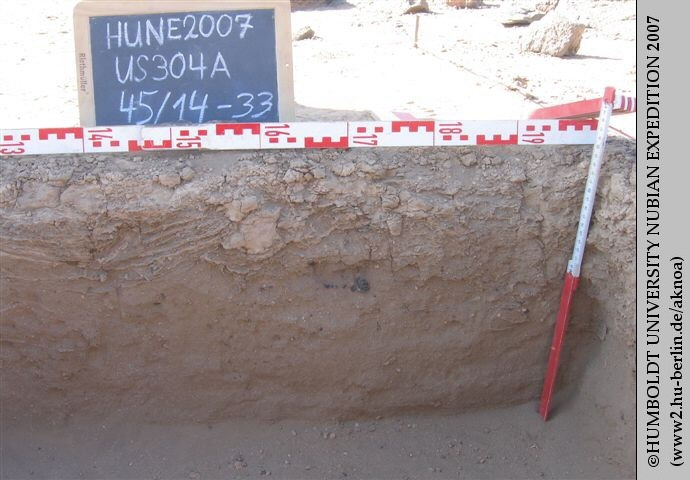 Photo22: Overview of the Kerma habitation site US304. Photo23: Section of a fireplace with pieces of charcoal from US304. 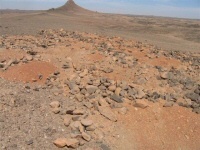 Cemetery US307 is situated on a quartz ridge to the east of Gebel Us in the vicinity of the village Ez-Zuwail. Two groups of stone ring superstructures were situated on the upper slopes of the ridge, stretching from the northwest to the southeast. The southwestern group consisted of 30, the northeastern group of 63 stone rings, nearly all of which had been robbed. Only in the northeastern group five graves had remained intact, as well as two graves which are located a little apart from the main groups. When destroying the cemetery quite thoroughly, the grave robbers must have looked for gold or other treasure, as they threw away the pottery they unearthed. 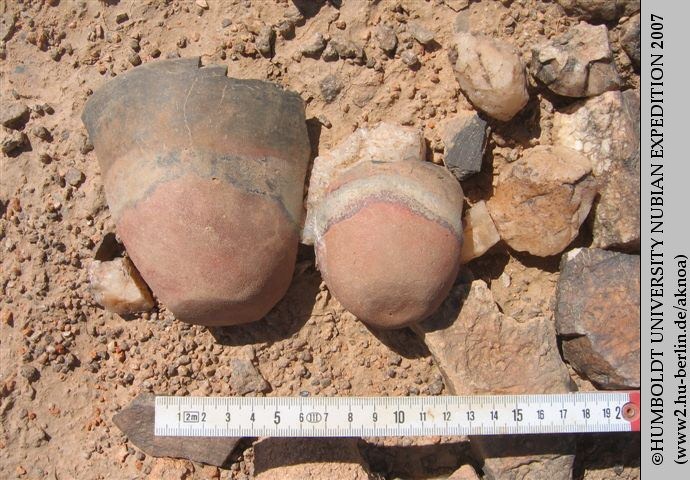 Judging from the numerous large fragments of Kerma beakers it is likely that many hitherto intact vessels were destroyed in the process of the illicit digging. Our team mapped the finds in the respective spoil heaps beside the graves and then collected them. 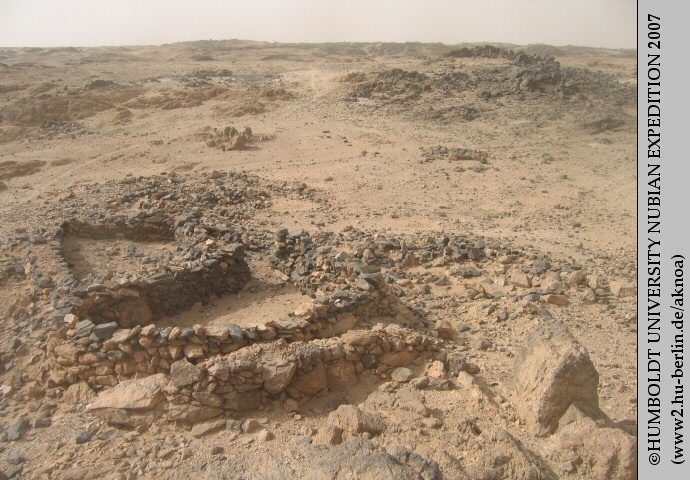 It is hoped that this strategy permits the investigation of the horizontal stratigraphy of the site and eventually allows conclusions as to the chronological development of the site, despite its irreparable destruction and the loss of much valuable information on past people and their mortuary beliefs and customs. Photo24: Overview of robbed graves at the Classic Kerma cemetery US307. 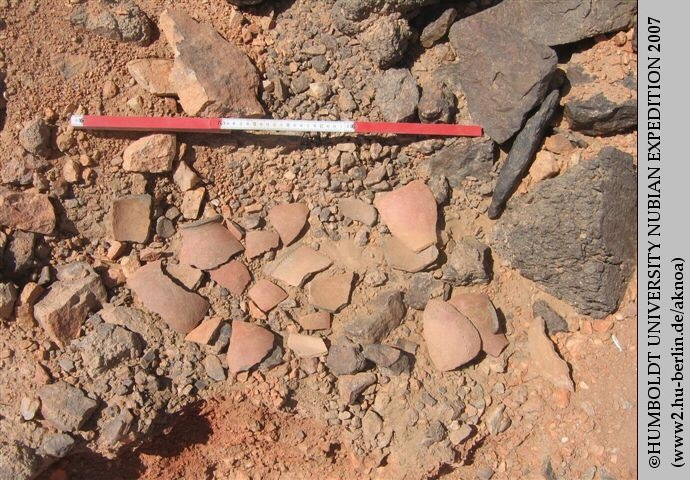 Photo25: Sherds of two Kerma beakers from spoil heaps at US307. Photo26: Plundered burial at US307. 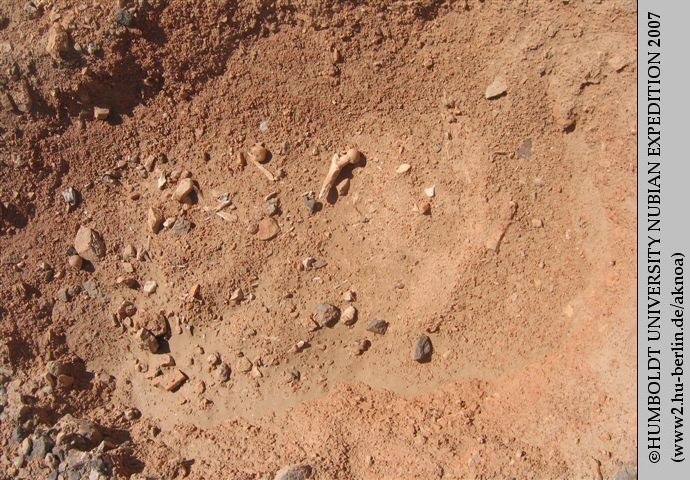 One of the most important sites discovered during the 2007 survey was a concentration of Middle Palaeolithic stone tools. 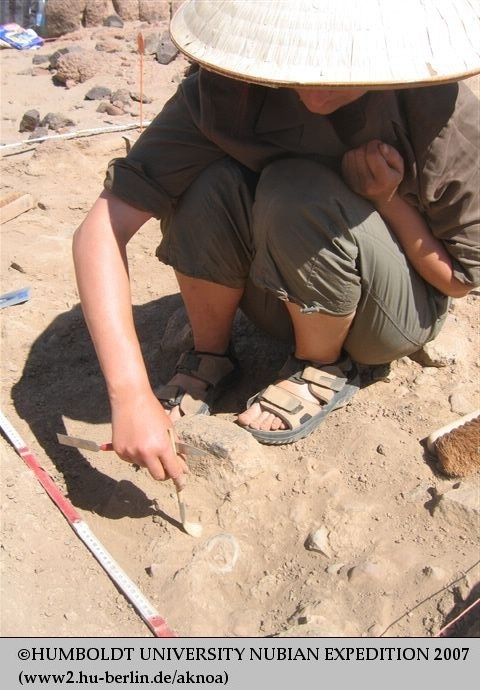 Hitherto only isolated finds had been located. Site US423 is characterised by a loose scatter of artefacts, which extends over an area of c. 200 x 50 m stretching over several narrow rocky terraces. The artefact concentration is most pronounced in an area of 10 x 5 m. US423 is situated in the southern central part of the island, to the east of the large post-Meroitic cemetery US009. 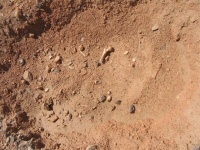 Apart from a beautiful Levallois point, a number of Levallois cores and flakes, as well as further cores and flakes were found. The artefact concentration is divided into several zones due to the limited preservation of the sediments. It is likely that it has been shifted vertically because of ongoing erosion. Apart from a further Kerma period settlement site (US424) that was discovered in the southwest of the island, a substantial Christian period settlement (US426) deserves mentioning. It is located on a high granite ridge close to the western bank of the river. 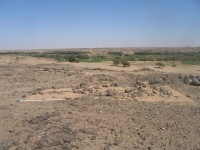 The ridge runs between the river bank and a dry palaeochannel of the Nile, which is today used for agriculture. At the northern end of the ridge on a rocky terrace drystone walls were located, which seem to have formed several rooms. In this area numerous medieval sherds were found. 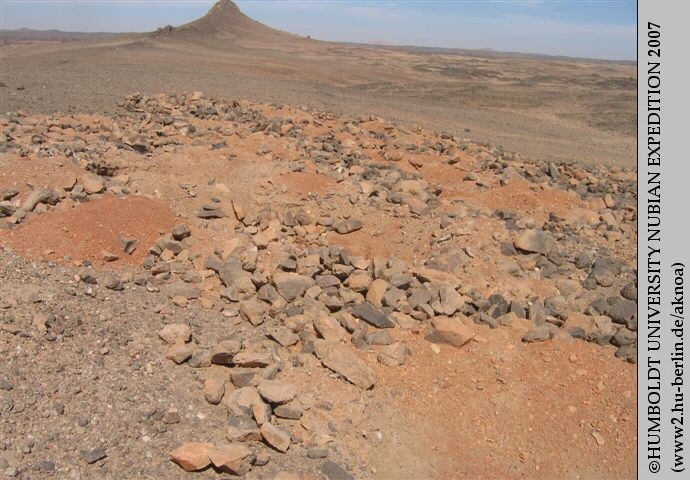 Further structures, such as stone rings, and dense scatters of ceramic sherds stretch along the summit of the ridge for another 250 m.
Photo28: Overview of site US403, a Middle Palaeolithic artefact concentration. Photo29: Levallois point from US403. Photo30: Remains of drystone walls at the Christian settlement US426. 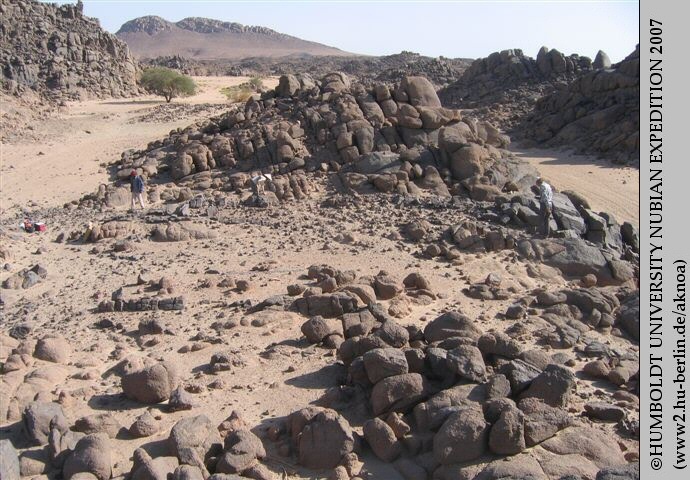 Rock art is one of the most frequent categories of archaeological remains in the region, providing fascinating insights into past life-worlds above the Fourth Cataract. In the 2007 season 226 rock art localities were documented across Us, raising the absolute number of rock art sites recorded on this island since 2004 to 404. This is the greatest concentration of rock art sites known from the Fourth Cataract. The strongly varied motif corpus of Us includes many forms that had not been recorded before in the Fourth Cataract region. The exceptional density of rock art on the island, the rich motif corpus as well as the high technical quality of many of the petroglyphs are remarkable and single out Us island as a focus of rock art making in the Fourth Cataract region. The corpus of motifs could be extended in comparison to the 2005 survey. It comprises mainly zoomorphs, such as cattle, giraffes, birds, camels, dogs, elephants, or snakes, but also many anthropomorphs, depictions of churches, crosses, monograms, cryptograms, as well as the largest recorded corpus of boats in the Fourth Cataract region. In contrast to most other regions of the Fourth Cataract, composite motifs are common, as well as apparent scenes, such as hunting scenes, or humans engaged in various kinds of interaction with each other or with animals. 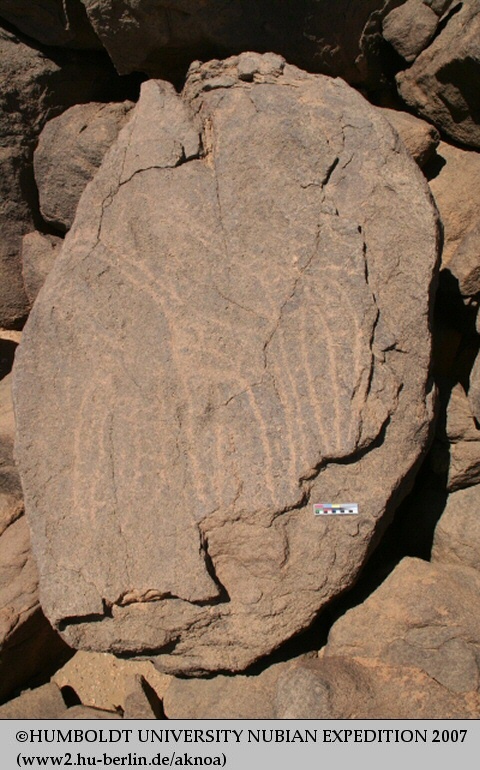 The majority of the petroglyphs on Us dates to the past two millennia, but there is a significant element of older rock art, represented particularly by cattle and some of the giraffe motifs in the southern part of the island. 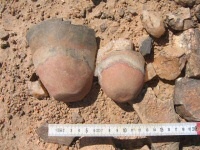 These appear to date to the Kerma period or older. Especially noteworthy are numerous representations which on the basis of stylistic attributes and their iconography can be attributed to the Meroitic period (300 BC – 300 AD). 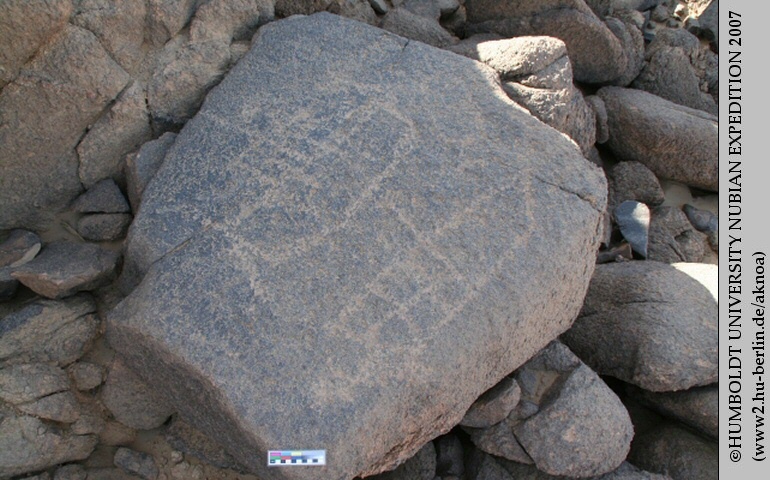 So far, other archaeological evidence for this period is rare in the Fourth Cataract, indicating that rock art research can significantly contribute to our knowledge also of the settlement history of the region. With the 2007 campaign a better understanding of the distribution of rock art on Us could be achieved. Most of the rock art is found in often extensive clusters on granite boulders and outcrop rock in the south and the centre of the island. The location of the various petroglyphs in the landscape points to a change in landscape characteristics and use over time. 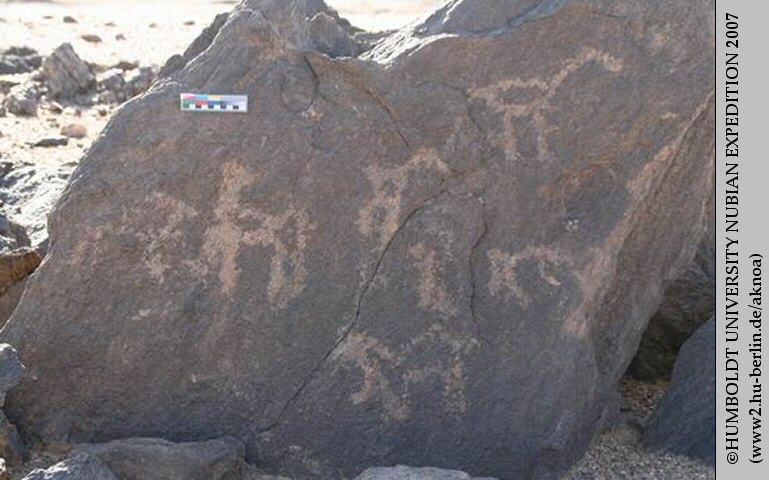 In the south, for example, the petroglyphs are located alongside the wadis, with older cattle depictions occupying higher and younger camel depictions occupying lower positions in the terrain, corresponding to the situation in the landscape of archaeological sites of the Kerma period and the Post-Meroitic and Christian periods, respectively. 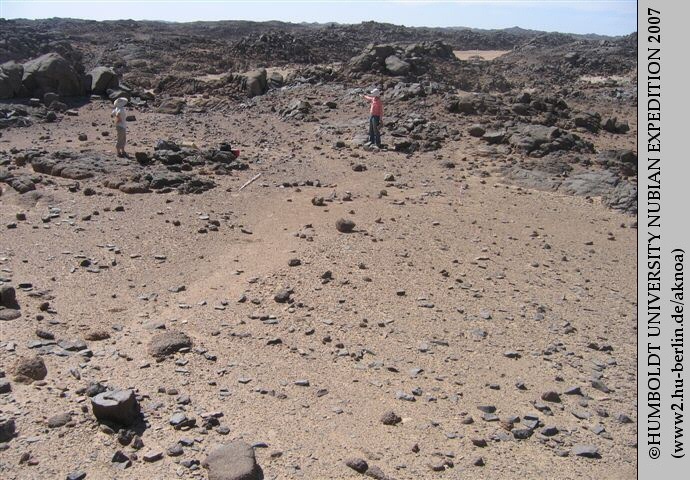 The analysis of the location of the petroglyphs in relation to landscape features and to other archaeological remains thus promises to provide a further important element in the reconstruction of the settlement history of the island. Photo31: Image of a church from site US405. Photo32: Small boats carrying camels from US309. Photo33: Large boats and cattle motifs from US310. Photo34: Two boats from US317. Photo35: Three giraffes from US437. Photo36: Panels with camels and human figures carrying large ‘lances’ from US368.